The following closures, late starts and snow warnings were posted as of 7:45 a.m. Tuesday, Feb. 5. 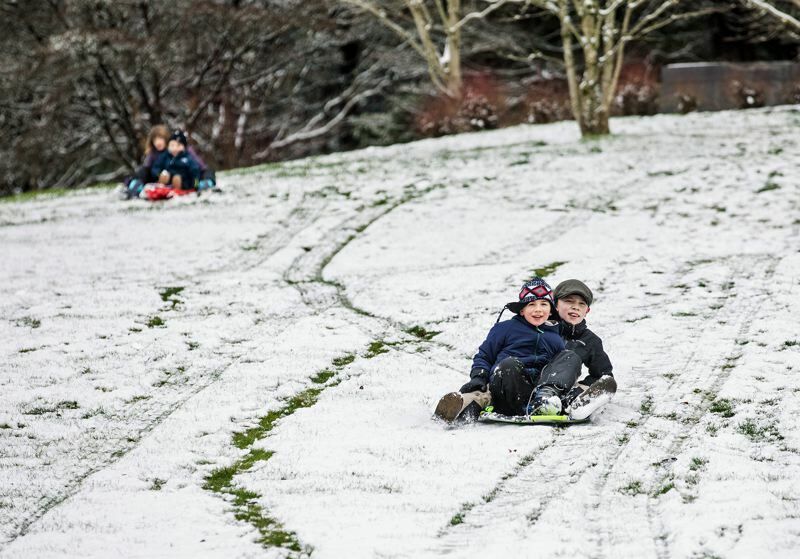 Beaverton School District: Two hours late; buses on snow routes; no morning preschool. Horizon Christian of Tualatin: Two hours late; Learning Center opens at 10 a.m.
Jesuit High School: Regular late-start Tuesday schedule. MITCH Charter School: Two hours late; watch for update at 7 a.m.
Montessori School of Beaverton: Closed. Northwest Regional Education Service District of Washington County: Two hours late. PCC: Opening at noon. Gates and doors open one hour prior. For updates go to alert.pcc.edu. Sherwood Charter School: Will be on a two-hour delay schedule today. Sherwood School District: Two-hour delay; no morning preschool; morning buses on snow routes. St. Anthony School in Tigard: Two hours late; school day begins at 10 a.m. Drop off students at 9:30 a.m.
St. Matthew of Hillsboro: Two hours late; doors open at 9:55 a.m.; no morning Viking Club; no morning preschool. Tigard-Tualatin School District: Schools and district office closed today. Update on evening activities will be made at noon. Tualatin Early Childhood Center: Two hours late; no morning preschool; will monitor and update at 7 a.m.
Tualatin Valley Academy: Two hours late; doors open at 9:45 a.m. School begins at 10 a.m.
Valley Catholic School: Two hours late; all campus schools open at 10 a.m.
West Hills Montessori: Southwest Portland and Lake Oswego campuses closed. Westside Christian High: Closed. School is canceled. Morrison Child and Family Services: All clinics and offices open at 10 a.m. Essential employees in residential programs must report on time for all shifts. Virginia Garcia Memorial Health Center: All clinics, School Based Health Centers and administration will open at 10 a.m. Patients with appointments between 8 and 10 a.m. will be contacted directly to reschedule. King City Civic Association: Office opening late, after 10 a.m.; golf course closed; staff arriving as road conditions safely allow in their areas. Will update as conditions change. Tualatin Hills Park & Recreation District facilities: Opening at noon. Washington County: Public closure of buildings until 10 a.m. Board work session delayed to 10 a.m. Regular board meeting delayed until 11 a.m.
Washington County Circuit Court: Two hours late; court employees and jurors report at 10 a.m.